Now you can have matching rear bumper on your Polaris RZR. Designed to match the EMP front bumper style. Laser Cut and CNC Formed insure a perfect fit every time. 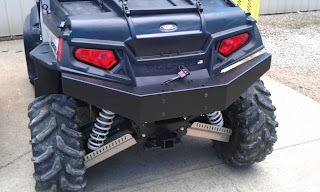 Allows, you to mount winch on the rear of your RZR. Laser Cut from 1/8 inch thick steel. CNC Formed to insure a perfect fit. Allows you to mount up to a 3500 lb winch on the rear. Fits: 2008-11, RZR, 2010-11 RZR-4, and 2011 RZR-S (will not fit the 2009-10 RZR-S unless you remove the rear cage. Fits: 2008-2011 Polaris RZR 800 and 2011 Polaris RZR S, 2010-2011 Polaris RZR 4. Will not fit the 2009-2010 Polaris RZR S unless you remove the rear cage. Will not fit the Polaris RZR XP 900.